Go Live and Connect Instantly in Real-Time to a large audience Anytime, Anywhere with a camera in your pocket. Live Broadcasting extensively increases User Engagement in the Community with a Fun, Interactive and Powerful way. Select Audience Privacy from Pre-established lists and go live with a set of Friends, Networks, Acquaintances. Add Location you’re going live from or want to highlight the place you are at for your event, game, holiday, etc. Push Notifications sent to the required audience to invite them to watch and engage in your live video. Live videos when shared in Story, remain there as per the Story Expiry Time set in the Admin Panel. 4. Quick Delivery of Content to the end users, when compared with Blogs, Articles etc. 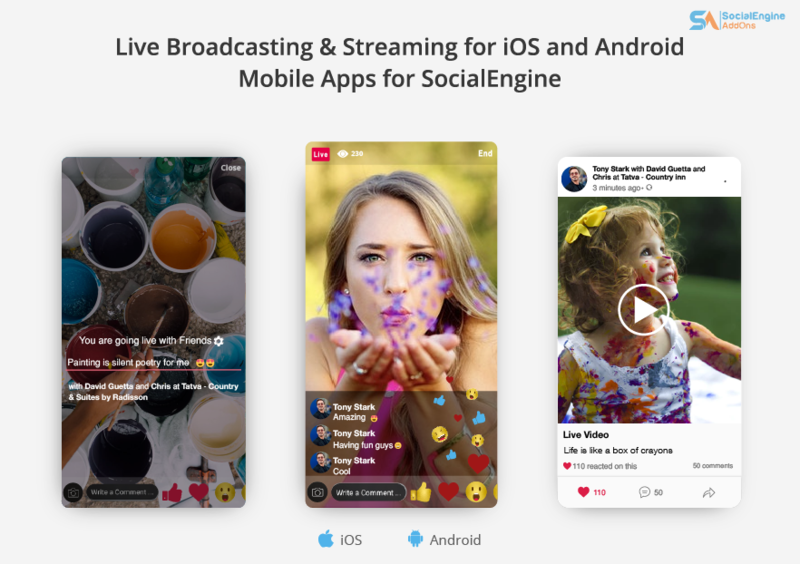 If you have a community based on Social Networking, Sports, Events, Blogs, Travel, or any you can think of, Live Streaming will definitely bring new life to your Community. Get it now for your iOS and Android Apps and see your community grow at a faster pace than ever.